Read the outcomes of this excellent bit of research from an Adelaide high school student into knowledge and attitudes relating to nuclear power. A couple of months ago, a family member of mine let me know about a high school student who was looking at nuclear power for a year 12 project. She said he was taking some flak from his peers for even looking at the issue, and he was starting to wonder if anyone else even thought nuclear power mattered. So it was that I met Michael Bills. After quickly disavowing him of the idea that he was on his own, I answered some of his very good questions. A little while later, he sent me the findings of his research. I was amazed at what Michael had achieved, and asked him to write it up for DSA. I don’t think this is good work “for a school student”. I think this is good work. I hope Michael gets to play with some bigger canvasses in future to further test and refine these processes and results because he has a lot to offer this discussion. 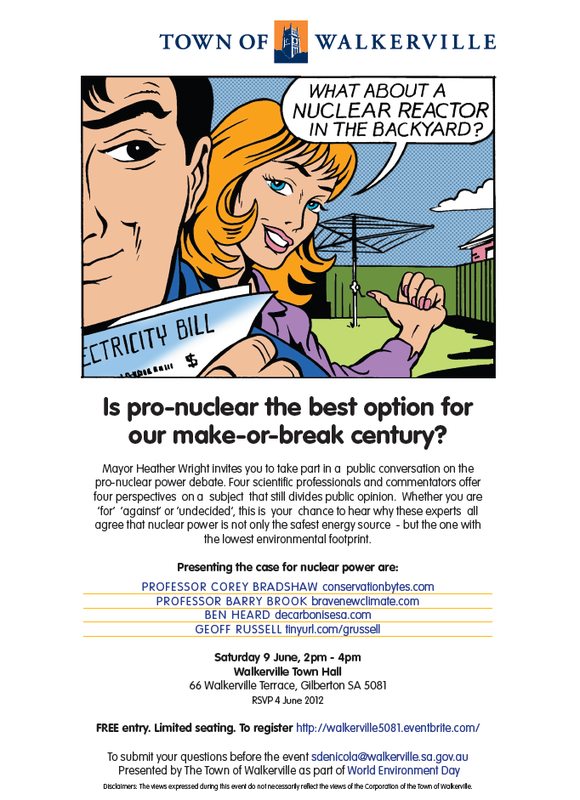 As you will read, the theme of this post means it it quite appropriate for me to remind everyone of a unique opportunity to hear the case for nuclear power presented by four prominent environmentalists and commentators, to be hosted by Walkerville Council on 9 June for World Environment Day. There would be few better opportunities to ask questions and engage in discussions about nuclear power as a potential option for Australia. You can read more about it here and register here. I’m Michael Bills, a student at Pembroke School doing my research project on ‘Whether Australia should switch to Nuclear Energy’, focusing on the public’s opinion of the issue as well as the general facts surrounding it. There is an overwhelming amount of evidence that supports the existence of climate change. From increased recorded temperature to the disappearance of arctic sea ice, there are few that will refute climate change’s existence. Even if one belongs to that minority, there still exists the problem that there is a finite amount of fossil fuels left in the world. At the end of the day, there is no way continuing on using fossil fuels as a power source is for the greater good. When it comes to alternatives, nuclear is the way to go, plain and simple. It is the only power source that is comprised of readily available technology which can not only meet our current energy requirements, but also our growing needs. It is absurd to expect anything other than a growth in the requirement of electricity over the coming centuries, and as such, our power supply choices must be made accordingly. Nuclear all but eliminates the greenhouse gas emissions from the power generation sector, and it does so cheaply and efficiently. With new generation IV reactor technology, there is the additional advantage of creating enough electricity to either power electric transport directly or create synthetic fuels for transport. Once we reach that stage, the two biggest producers of dangerous emissions are essentially dealt with. If Australia reaches this stage, we can be proud to honestly say that we are doing the best we can to stabilise our climate. Explaining why nuclear energy is the right idea to an audience such as this is incredibly redundant. Instead I’m here to present my own original findings in regards to my age group’s opinion on the subject. In the end it will come down to the people’s opinion, and within the next year my age group will be voting. As such I believe that through the education of my generation, progress can be made in regards to getting nuclear approved within Australia. What’s stopping nuclear energy? – The people. Initially I merely spoke to my classmates about their thoughts on nuclear energy. Surprisingly (at least to me) I was met with an extraordinary amount of negativity in regards to not only my topic, but the fact that I would question what I believed to be myths surrounding it. To say that I supported nuclear energy was like saying I supported the murder of innocent people. After a while I noticed a pattern where the discussions with people who seemed to know a lot about the issue agreed that nuclear energy was the right way to go, and vice versa. I quickly designed a small handwritten survey that explored this relationship. I had a couple of quiz questions, such as ‘Can a nuclear reactor explode like a nuclear bomb?’, and I asked if the person agreed with nuclear energy in Australia. The feedback received from this initial survey was interesting, there seemed to be a correlation between the people’s ‘knowledge’ and whether or not they agreed with nuclear energy. 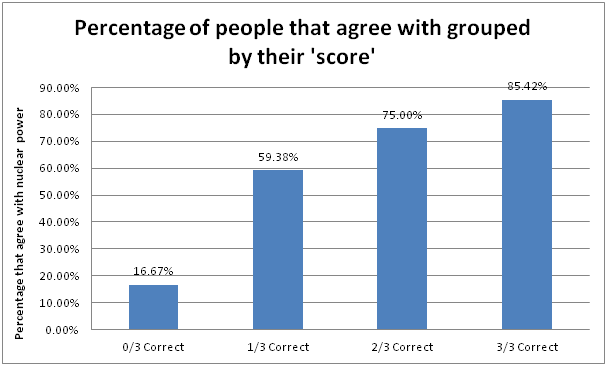 Additionally, people were openly aggressive in defending their definition of ‘a survey’, with many people saying that you cannot include quiz questions, they must all be based on opinion. One legitimate complaint was that the survey drove the sample towards a favouritism of nuclear energy due to the wording of the questions; it was directed and biased towards my own opinion. With this on board I developed the next iteration of the survey and hosted it online. It contained the following questions, with the ‘quiz questions’ marked in red. Is there anything you would like to add? Long text box answer. I tried to keep the questions limited to ‘yes or no’ answers, while still providing a place for them to give feedback (and abuse). I distributed the survey among my peers, collecting a total of 189 responses. 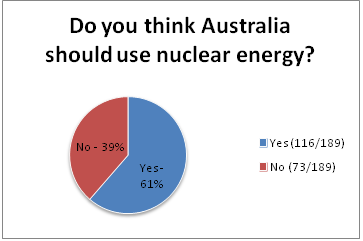 Overall 116 people answered ‘Yes’ to the question ‘Do you think Australia should use nuclear energy?’, and 73 answered ‘No’. That is a 61% ‘Yes’ vote, which is of course a majority. By this statistic alone I am convinced that the battle in favour of nuclear energy is by no means impossible to win, quite on the contrary. The main argument I encountered against nuclear energy is that it is unsafe. 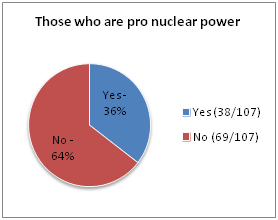 Of the people that didn’t believe Australia should use nuclear energy, 70% of them answered ‘No’ to the question: ‘Would nuclear energy be acceptably ‘safe’ if it were used in Australia, under appropriate government supervision?’ Additionally, 64% of them answered ‘Yes’ to the question ‘Do you think Leukaemia rates are higher near nuclear reactors?’. This discrepancy in responses forced me to apply some filters to the data. At this stage, each participant was given a ‘point’ for every ‘quiz’ question they got correct. This gave them a score out of three which could be used to ‘rank’ their results against each other. 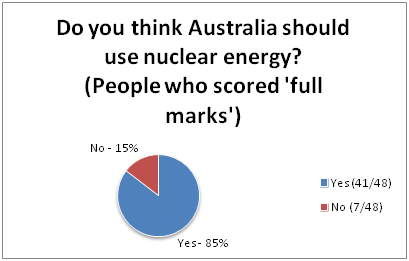 Of those who scored perfectly, 85% of them agreed that Australia should use nuclear energy, a massive improvement on the previous statistic. A total of 12 people that were self-proclaimed ‘somewhat knowledgeable’ got none of the quiz questions correct. Of those, only two believed that nuclear energy should be used in Australia. That is, 83% of them were against it. At this point I plotted a graph of the amount of questions the participants got correct against the percentage of them that agreed with nuclear power. The obvious proportionality shown, in my opinion tells us one thing: If we want nuclear power to be accepted by the masses, people need to be educated on the topic. I am certain that most opinions on the topic are heavily influenced by the public media, and the majority of people know this. 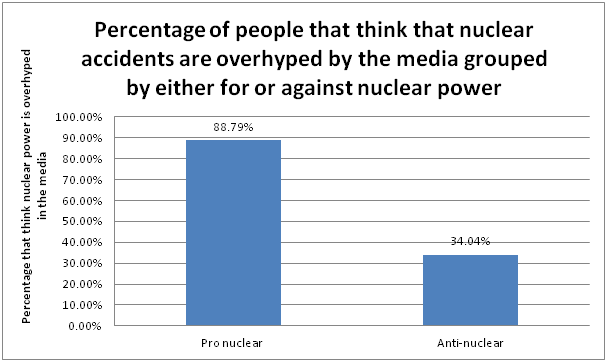 When asked if they believed that accidents involving nuclear energy were over hyped by the media, the majority of people said they were. If we split this up into people who are pro and anti-nuclear, we see a correlation. Do you believe accidents involving nuclear energy are overhyped by the media? 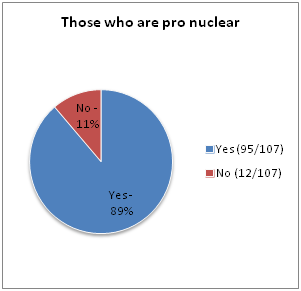 As you can see those who are pro nuclear are far more likely to believe that nuclear accidents are accidents are overhyped by the media, while those against tend to believe the media is truthful. In response to alternative energy sources, there was no clear winner as to whether wind, hydroelectric or solar alternatives could sustain Australia. 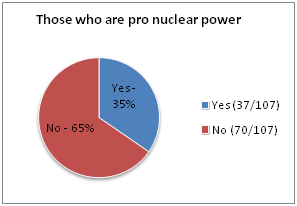 The difference occurs when the results are split by their initial opinion on nuclear power itself. Can Australia get along fine with wind / hydroelectric / solar alternatives as opposed to nuclear energy? One part of this nuclear debate that I am still undecided upon is the issue of accepting other countries’ nuclear waste. I found that absolutely every combination of filters resulted in the same result: we don’t want other countries’ nuclear waste in Australia. Do you believe Australia should accept nuclear waste from other countries for storage? 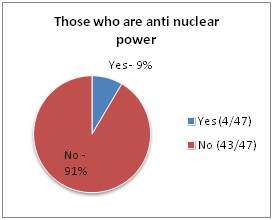 Not so surprisingly, 91% of those who are anti-nuclear disagree with accepting waste. While year twelve physics students undertaking the SACE will study nuclear physics at some point in their curriculum, this group of people represents a very small portion of the demographic that should be targeted. Television advertisements come to mind, but getting them to run in a media dominated by the idea that nuclear is bad would be an expensive and possibly ultimately futile effort. Viral YouTube videos spring to mind, but they rely on entertainment for the most part for their virality, so how does one combine entertainment into, an honestly quite dry subject for the vast majority of people. The truth is that I don’t know the best method of educating people on this topic. My efforts to suggest things to people different to their opinion have been met with disproportionate hostility. It is perhaps the biggest hurdle that will be faced by the nuclear energy movement. If you would like to make sure you can answer Michael’s quiz questions correctly, and learn a whole lot more, please come to this event. Great job Michael, excellent work. A 2012 vid is currently in the making. We could make a more general vid for nuclear technology in Australia. It doesn’t have to be full of fancy animations, it could just be like the Thorium Remix. Say, ‘Nuclear Remix Australia’. (But dare I suggest thorium power generation be considered in Australia for a longer term solution after we use up already mined uranium and uranium waste. It’s a very interesting video! However I think a viral video should be a short, sharp and effective advertisement for the issue, not so much a two hour long talk about it. Additionally, going viral should be an outcome of releasing it, not so much a design point of the video itself. If it’s good enough, it will go viral on its own. I think this video is quite a nice example of a ‘viral ad’. It wasn’t designed to go viral, it was just a very well designed advertisement. The above video has that production value, which sadly I think all the nuclear videos I’ve seen have lacked. On another note, are there any thorium reactors currently operating in the world, providing power? Michael, you may have viewed the version where after the 5 minute overview it continues on to the full documentary. There are many ‘remix’ versions of Thorium2011 for different purposes. I agree viral vids have to be short. I would nuance that suggestion: thorium should enter the mix as soon as it can. I’m a big believer in all zero carbon deployment, each according to its advantages. I am quite sure that adequately developed thorium would have sensible deployment options even in the midst of a mature IFR scenario. Fantastic job Michael! Whilst the sample size is small, the results clearly demonstrate that the job of convincing the public isn’t as hard as we think. I would love to see Michael get the opportunity to work with some people who can resource a larger sample size to test these methods. The results are so strong that while I large sample might moderate the outcome somewhat, I think a strong finding would still be there. How can we make this possible? Get in touch with the right people, kick in some funding? I think he could get some organisations interested (universities especially) if he expanded the survey scope to cover a wider part of science education as well. I have some links to the Australia Institute, they do this a lot. Historically, they have not really wanted to explore nuclear but that may change. You know who you are, if you can help Michael, please let me know. Even if you can let me know about the expense of securing a larger sample, then I might be able to pass the DSA hat around, so to speak. Unfortunately I don’t have much experience with statistics or polling nor know anyone in particular who could help with this sort of thing. My only suggestion for Michael would be to contact some universities about expanding the survey and what would be required to do it. I would be happy to pay for, host, and develop any website that might be useful for such an exercise. That’s wonderful Tom. Thank you. We use Survey Monkey for our surveying needs across the Victorian public service these days. The tools are so much simpler and more accessible in this internet world. The real difficulty is in driving the right people to the survey to answer questions – how do you get statistically significant populations of previously unbiased/not vested people to respond? it would be easy to get pro or anti nuclear people to respond, but that’s not going to help anything. That’s where a market research company is needed, probably sponsored by a thinktank. What aboutper capita, or the Grattan Institute? They’re the only two that really come to mind. Or maybe CEDA? Wilful, if a similar survey to what Michael has done uses questions to categorise which ‘camp’ people are in, for the purpose of weighting the ‘camps’ with the outcomes of his survey. I don’t know how introducing ‘random sampling of population’ would be any more accurate than analysing the data like how Michael has done. This is what sets his project apart, although I suppose malicious people would quickly work out what’s going on and could email their malicious buddies to stuff it up. I found survey monkey’s free package to be quite limiting in terms of what I could do with it, so I grabbed a copy of an open source php based survey tool called LimeSurvey and hosted it myself. False data is always an issue with an online survey, but an online survey will be easiest to send to many many people. I think even sending the survey to universities would be an interesting avenue to venture into. While there would be some bias in the data due to everyone’s standard level of education, its more data! I see Mike Rann will be chairman of Low Carbon Australia. http://www.thefifthestate.com.au/archives/35150 That would be the same Mike Rann who thought granite geothermal would provide baseload, who banned uranium mining in Arkaroola and evidently thinks a doubling of gas prices will be good for SA. The point of this tirade is that while the man in the street may approve of nuclear power, obstructionists in high places can ensure nothing happens for years or decades. Somehow we have to jab a sharp stick at people who sit on high powered committees and say um yes nuclear may be an option but not while we have all that lovely wind and sun. If say SA emissions reduce 1% while the economy shrinks 5% that’s not good enough. Emissions must decline while the economy still holds up. Indeed, this is a political problem. But it is also an educational problem,not only for the politicians but also for the proles. So both barrels of the shotgun are going to have to be fired simultaneously. Don’t worry about the recoil. it is encouraging to see a member of the up and coming generation like Michael taking competent and positive steps to inject some reality into the energy and environmental debate.All is not yet lost if a good number of the younguns can see the light. I’ve witnessed scenarios such as the anti-SOPA movement where even though there was huge corporate and governmental support for a bill, the people’s disapproval halted it in its tracks. It makes me confident that with enough of a following, the opinions of people like Mike Rann won’t matter. The issue is getting that following! You’ve captured a really important demographic here – one we rarely hear from. I’d be interested to hear how your teacher/s responded. I assume your physics teacher would be on board with regard to nuclear power but what did she/he think of your results regarding the correlation between a persons level of knowledge and their pro- or anti- stance on nuclear power? Did they find it compelling? Would they help you test the hypothesis further? I’m thinking here, that you could suggest to your teachers a presentation from our own Ben Heard to your whole senior year (there was a time last year when Ben was spruiking for gigs – but perhaps you are too busy now Ben?). If you were game, you could even join Ben on stage and explain your own findings as an introduction to Ben’s presentation. Now that, I would love to see – it really is impressive work Michael. I have had similar experiences in many a face-to-face (or screen-to-screen) conversation, but I think two-way conversations can be a pretty confronting way for people to first have to question their position on an issue. Conversations require immediate responses, but people need time to mull over a change in perspective. A presentation can provide one an opportunity to consider information without feeling pressured to make ones mind up straight away. Of course a person must still be open to reason and evidence but if the presentation is held by someone who is felt to be sufficiently knowledgeable and trust worthy then the rest should follow. A very good one. Schools are (rightfully) difficult to access for external parties giving presentations, so yes, it would require an invitation from Michael and the support of the teachers. We’ll see. Thank you again! I’ve got no problem having Ben over to talk to my school, it’d be up to the school really, I’ll ask my teachers if something could be arranged. We’ve been through a bunch of cyber safety and drug and alcohol talks over the past few weeks, so I’m sure people would welcome a political issue as an interesting change. “I wonder how the good citizens of Walkerville feel about their Mayor and Council using ratepayers’ money to promote dangerous nuclear energy?”. It seems you have double standards, as you’ve just taken a broad swipe at nuclear power generation technology by labelling it as ‘dangerous’, without any reference to which technologies or if you include passive safety power generation systems that the four experts will no doubt probably discuss at the forum. I think that if you are genuinely concerned for the environment, you would want to hear about how these nuclear power generation systems have been so well improved – but untested because due to Fukushima people are now too scared. I hope that you’d be open to considering that maybe the systems have improved immensely since the Greens have formed their opinion, and all of the concerns that Greens have about nuclear power generation can be addressed. I’m even happy to do you a deal. If you attend, I’ll attend too. It would be great to see what you think after hearing these experts talk. Ok. I had been expecting this. The journalist got in touch with me last week. It’s probably worth pointing out straight away that the promotions of the event has been handled by Council, not the speakers. Council informed the primary school of the event and provided the material, but did not direct them to send it out to all families. That said, I am not particularly clear on what the problem is. It is an open community forum, free of charge, and they are letting the community know that it is on. I would have thought that is good. None of us represent political parties or candidates or are planning to run for office ourselves. From our perspective the issue is an environmental and technological one. That it is automatically regarded as political is a brilliant illustration of the problem that we would like to address: that Australia is not stepping back and taking an objective, non-political look at the technology of nuclear power as a solution to climate change. As it is, basically no political party in the land, except for the very obvious, is out there running a pro-nuclear power platform!!! The very last thing this event is, is political. The event is presenting four perspectives, though all speakers have come, quite independently, to the same overall conclusion. I think this should be of interest to people. The majority of the session will be for interaction, discussion and questions and answers; presentations are deliberately very short. It is very much an opportunity for conversation and dialogue. Who knows, but I am reasonably sure that if the flyer was for an event discussing any other form of zero carbon energy generation with the speakers in overall agreement, for World Environment Day, no one would have minded. It raises this controversy because of the stigma. All the more reason the event should run. Tom, I quite agree that for Mark Parnell to spruik the sacred role of education, only to engage in a bit of blatant, and very political, anti-nuclear scaremongering in the very next breath, is quite unbecoming. So I wonder if Mark Parnell says the same thing when the Council hosts an event by four people talking about the seriousness of climate change or biodiversity loss? Does he call for a balanced debate by insisting that Ian Plimer and Alan Oxley both get their turn? I strongly doubt it. So why the double standards? It is also strange that they are trying to construe pro-nuclear advocacy as a ‘political’ position. Where do they get these ideas? Are they ‘projecting’ I wonder? An article suggesting this event involving four non-political figures is political, goes on to take supportive quotes from a politician playing politics. I’m not sure if I’m confused, or they are. 3) indefinite postponement of the OD expansion. Of course NP cannot soften these problems immediately but if the public can think in a multi year time frame they can see it must help. A little off topic (I hope) – there is an interesting report by Meredith Angwin on ANS Nuclear Cafe (May 29). It is an account of a recent meeting chaired by the NRC at Brattleboro,Vermont. The meeting was hijacked by a crowd of militant anti-nuclear pests in an obviously premeditated attempt to shut down free speech. I’m not sure that it couldn’t happen here. Whether or not they manage to hijack it I don’t know, but there is a protest of the event being organised. You are hardly coming from left field on that one. Really? How disappointing. I hope they are prepared to sit, listen and engage. I won’t inflame matters by going into details here, but no. Indications are crystal clear that that is not their intention. I can attest to this. I’ve seen a few things mentioned. Do the organisers know of this event to ensure that there is no public disturbances or stifling of discourse? The greatest failure is these people are supposed to be advocates for the left side of political ideology which equality, openness, and tolerance are a big part. By disallowing ordinary citizens to test discourse on nuclear power on the fear they may support it after an adult and robust discussion is a travesty. It is exactly the same as what those “Christian” preachers do in Rundle Mall. Mortality is powerful for pushing people’s ideologies to the extreme. The radiation = cancer = death is a stigma that no only is untrue in it’s holistic sense (cancers are not all fatal), but the biggest issue on the promotion of nuclear power as a safe energy option. Best tool I have is the Argonne National Laboratories “Radiological and Chemical Fact Sheets to Support Health Risk Analyses for Contaminated Areas”. It has Mortality and Morbidity risk characteristics for ingested and inhaled radionucleides. Surprisingly you have to inhale (which is worser than ingestion) 5000 3 micron particles of Plutonium to have a 1% increase in your risk of cancer (on US rates). Beats the 1 atom and you’re dead line I’ve heard around the traps. Back on topic, this survey is very interesting. Supports many I have seen, people in public will be shy or dismiss nuclear however in private they will be supportive. It is a phenomenon discovered in a Cameco survey on the uranium industry. A person will privately support the Uranium industry, however thinks a great majority of his/her peers will not, when in reality there is a majority support for the industry. Perception, not reality, is key. I like slotting in the quiz questions to test education, nickname it the Bills Methodology. Very well done! This happens for all of these events. I have noticed that some Dr Ziggy Switkowski in particular seems to have his own ‘fan club’ that follows him around to his various presentations. Professor Brook seems to have attracted a similar cohort as well now. I’d welcome them to the event, provided that they are able to behave like mature adults. If they don’t, well I hope there’s someone to eject them from the building. Indeed, the whole point of the event is that those of differing opinion can really test us out on all the issues. There is a difference between that and blatant disruption. We’ll just see I guess. Great job Michael. What’s the next step? I’d send your results to The Age, Catalyst and Lateline. I think they are worthy of much wider coverage. Great job Michael! What’s next? Send your results to Catalyst, The Advertiser, The Age, Lateline. They deserve much greater coverage. I had thought this worthy of a press release too Geoff. I’ll see what Michael says. Thanks! I’d love to get the results out there, and maybe the ABC could facilitate the distribution of the survey to a wider audience? I better start writing up emails. Well done Michael. Great to see the most important generation of all being challenged to consider nuclear power. Keep it up and try to get yourself on Q and A . Ask Tony Jones to get a couple of pros and a couple of antis to answer the questions. If you’re interested, dial up http://www.abc.net.au/rn/ockhamsrazor and check the two talks i’ve given so far, one on Sept 4th 2011 and the other January 15th 2012. I’ve been promoting nuclear power for the last 14 years Michael having converted from anti to pro while on teacher exchange in Toronto Canada during 1981. If you want lots of information over and above what Ben Heard has given you, then please contact me. There’s a major issue with this survey data that I see. Michael has distributed his survey within a small subset of the population – and worse still, within a subset of the population that are schoolchildren who attend a reasonably prosperous school. Every person surveyed will be in a certain income bracket, and have a certain degree of education – purely by virtue of attending Pembroke School. The ‘quiz’ questions are also quite poorly phrased. A simple google of “leukemia nuclear plants” results in thousands of results such as “Study: Child leukemia doubles near nuclear power plants”. While there is no conclusive evidence that this is a cause of Leukemia, it certainly implies that the answer to the question “Do you think Leukaemia rates are higher near nuclear reactors?” is as clear cut as Michael would like it to be. “After the disaster, the pools and the basement were flooded because of ruptured cooling water pipes and accumulated firefighting water, and constituted a serious steam explosion risk.” <Re: Chernobyl. While this isn't exploding like a bomb, it is certainly an explosion – and it occurred in a catastrophic meltdown. One of the more obvious pieces of knowledge of Chernobyl was that it did explode, albeit not like a nuclear bomb. Sure – call those answers wrong, but there will be people who understand nuclear power who are included in Michael's "stupid people" column just because of those two questions which have misleading word choice and overly narrow yes/no answers. The sample size is a limitation. Doubt you’ll get much argument there, though in my opinion it is an excellent effort given Michael’s resources. From what I can see everyone here would love to see this approach tested more broadly. From what I saw, the quiz questions do a check of knowledge, not a test of intelligence. Answering incorrectly does not make anyone “stupid”. There are a great many people of excellent intelligence who are entirely ignorant regarding nuclear power. That’s fine, except when they seem determined to stay that way. I think the question about a nuclear explosion is perfect. Your inference seems to be that someone who “knows about” nuclear power might answer “Yes ,a reactor can explode like a nuclear bomb”. I disagree. There are so very many fundamental reasons that this is completely impossible, I humbly suggest that anyone answering “yes” to this question very likely knows little or anything about nuclear power, and needs to start from the beginning, like I did a couple of years ago. There is a heck of a difference between an explosion at a nuclear reactor and a “nuclear bomb explosion”. If it confuses people, that’s the point: they do not understand the nature of nuclear power and do not know this to be impossible. The leukaemia one I regard as a bit of a toughie. There would be a slew of potential questions to do this fact checking job, and this is a hard one because headlines like the one you quoted are out there, and stick in the brain. I was aware of the headline, and had it on my list of things to investigate. I thought it unlikely, and now know it to be wrong. Were I to rework this with Michael I would workshop some alternative questions to that one, as I think a great many people would honestly not know either way. But again, if someone is answering “yes” to this, I would not be confident that this person understands nuclear power. Then of course the other question is entirely straightforward, and many people got it wrong. Tick for Michael. Ignorance of the existence and role of Australia’s Lucas Heights reactor to me suggests a likely ignorance of radiological medicine, and I would not have high expectations that someone getting this question wrong “knows about” nuclear power. I think the questions functioned very well. I’ll certainly agree that the argument regarding the nuclear explosion one is considerably weaker – but the main assumption here is that in taking this survey, all of the individuals actually took the time to think back, recollect and answer with the best of their knowledge, not based on their first recollection on seeing the survey. I don’t think I was very clear in explaining that. I think those are some potentially useful alternative questions, at least as starting points. Not as easy as one might think though. Some very basic things are black and white, a lot is not. “Can nuclear waste be used to create a nuclear warhead?” for example. Basically no it can’t, but if the reactor is misused sufficiently, it could produce “waste” suitable for this purpose. Not typical waste because it would have to have been removed after only about a month instead of two years or so, which is incredibly expensive, slow and obvious, but you see what I mean? Those wishing to scare on nuclear fixate on that potential. Which answer to that question is “correct”? It needs workshopping. I’m not sure that there’d be enough people who have such an intricate knowledge of Chernobyl like you do, so I don’t think the phrasing “explosion like a nuclear bomb” would really make that much difference. I’m just saying this, because we’re talking about one lads school project here, not a university designed statistical survey. So to say “poorly designed” is just incredibly harsh. My point being, I hope your statistical survey expertise can be applied in a more constructive fashion. See reply above because somehow I managed to fail at replying – not going so well, heh. Also, sadly I can’t edit, but: Yes. The answers “Yes” were wrong for those two questions. There’s still the fact that those questions are poorly designed and *will* garner false positives. I for the most part agree with you. I would have loved to have a larger sample size since by the time you get to the proportionality graph, a couple people’s worth of answers could skew the data one way or another. The quiz questions could definitely have been worded in a manner to generate less potential false positives. Through my initial research I found most of my sources said that leukaemia wasn’t any higher near nuclear reactors, so I figured it was a good a question as any. I’d love to ‘have another go’ with a larger sample size with better questions, given the opportunity.